Valentine’s just round the corner. Book now. £23.50 three course set menu or £19.50 two course set menu. Full a la carte available. Complimentary chocolates on the table. Now is the time to impress, don’t miss out. Yum yum. Don’t forget we open early at 4.00p.m. for Thursford Christmas Spectacular. Come and enjoy a festive meal with us before the show. Starts 10th November. Look forward to seeing you all. Home made samphire soup. Local samphire from our local coastline made into a creamy broth absolutely gorgeous. Also strawberry and grand marnier ice cream using local strawberries from our local fruit farmer absolutely divine. Come and give them both a go. Lemon sole stuffed with capers and prawns – yum yum. Had it for lunch. Delicious. Another AA rosette to be added to our long list just been awarded for culinary excellence. The old man is still doing a good job!!! Listen to Radio Norfolk on Friday 13th November at 7.a.m. to hear us harping on about Tripadvisor again – all good fun haha. But try it this way – cooked in cream and sherry – wow. As a starter or a main course. So popular it flies out of the kitchen. Such a simple dish but beautiful. Yum, yum. Wonderful home made ice cream now on offer. Bannoffee flavour, strawberry flavour or honeycomb flavour – which one?? Yummy. Think it has to be strawberry tonight with a slight dash of grand marnier – gorgeous. All home made by Colin. We had a horrible experience over the weekend. A lady called in at 5p.m. and asked for a table on Saturday night and we were full but we said we could squeeze her in at 8.30p.m. if she liked and she agreed to the time, we asked her for how many and she said for herself, her mother and her three month old baby. We very kindly and courteously explained that probably the restaurant would not suit a tiny baby at that time of night when we have classical music playing, candlelit tables and an intimate atmosphere and she stormed off stating in a really aggressive manner that she was going to post a negative review on Tripadvisor – what chance do we stand!!? We now have a booking button on our website for our B&B so don’t hesitate book online for your accommodation now! We had our AA inspection and have been awarded four stars again for our accommodation. You are now able to book on line straight from our website. Check out our special offers at the moment. ONLY £50 FOR A DOUBLE EN SUITE AND BREAKFAST. 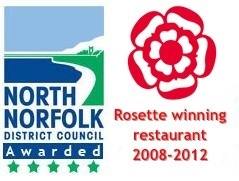 NO BETTER DEAL ANYWHERE ELSE IN NORTH NORFOLK.